Answer: For us this week will be less about the listing and more about the learning. Our knowledge of the online bookish world is, well, embarrassing. Despite the rose colored hue now covering our face, we’ve got our pen (erasable) and notebook (with Phineas and Ferb cover art) in hand and are ready to learn about all the amazing bookish resources inside our computer monitor. Celia Donnelly is about to undertake a much deserved beach vacation with her husband and teenage son. Between the stress of her job and less than perfect home life, she’s very much looking forward to the tropical retreat. However, almost as soon as she arrives at the resort, her plans take a dramatic turn for the worst. Being abducted and kidnapped has a tendency to do that. Celia is left with far more questions than answers and almost no one to trust. Her quest to find the truth will push her beyond her limits and take her halfway across the world. 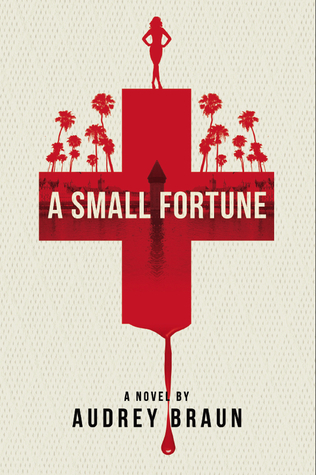 A Small Fortune is a quick, very suspenseful, yet not entirely faultless read. Overall, we (Erin) thought it was a nice blend of chick-lit and suspense and a solid debut novel for Audrey Braun. From the very first page, we felt like we were on the couch talking to one of our girlfriends about her harrowing vacation experience (we may or may not have prepared chips and salsa and frozen margaritas for the occasion). 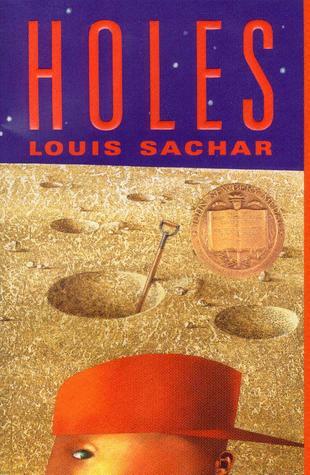 We enjoyed how matter of fact the narrator described the events and many of the metaphors blended nicely into the prose. Also, Celia’s relationship with her son (or lack thereof) was quite bittersweet, yet believable. It inspired us to give our frequently occasionally nagging preschoolers a couple of giant hugs. A Small Fortune didn’t quite fall into the “up all night” category, but we saw the other side of midnight on one occasion. Editors Note: This book was generously provided as an advanced reading copy. 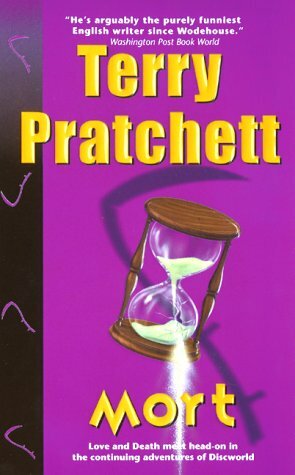 Why: If we’re being completely forthright, our recent Jaspier Fforde review binge is owed to our desire to review this particular book. Get ready for the love fest people! After taking refuge within an obscure, unpublished detective novel titled Caversham Heights, Thursday Next must adjust to her knew existence. For starters, she must carefully establish herself within the novel without disrupting the narrative. She also has responsibilities as a probationary Jurisfiction agent and is forced to stand trial for her role in the controversial Jane Eyre plot alteration. To make matters even more confusing, she’s pregnant by a husband who never existed. Oh, and her mobilefootnoterphone keeps picking up spam messages that detail the plot of Anna Karenina. In all the chaos, the chances of Thursday discovering the truth behind the sequence of BookWorld murders seems highly unlikely. Initiating love fest in 3... 2... 1... We (Evan) loved this novel! 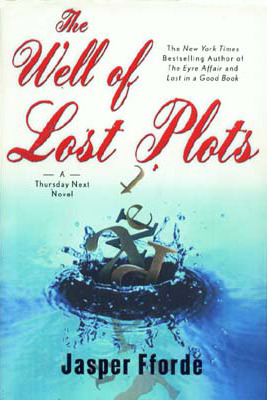 The Well of Lost Plots is located entirely within the world of books. The plot was easily the most suspenseful of the series and the anger management counseling scene involving the characters from Wuthering Heights could stand as the most hilarious in all of literature. We loved the creativeness and depth of the underground book world and have come to loath the illegal selling of secondary characters and unauthorized plot devices. The BookWorld was filled with concepts and characters that tickled our bookish senses. There were a whole host (pun intended) of Grammasites, which are parasite that lives in books and feed on grammar. Adjectivores are particularly dangerous as they drain all the description from an object. Nasty little buggers. We also came in contact with a great number of famous characters like Uriah Heap, clones of Mrs. Danvers, Mr. Toad, and the entire cast of Wuthering Heights. It should be noted that Heathcliff was nomination for Most Troubled Romantic Lead at the 923rd BookWorld awards (or Bookies). What a great book. What a great series. We look forward to many more adoring Jaspier Fforde reviews. Newly married and enjoying her position as Swindon’s favorite literary detective, Thursday Next is quite content with life. Unfortunately, life has different plans. Almost at once Thursday is swept into a blackmail plot that involves the eradication of her husband’s existence. Her only hope is to become educated in the subtle art of book jumping. And with Mrs. Havishum as her mentor, the chances of rescuing her husband are greater than ever. The only problem is that her chances were never really that good to begin with. It’s very likely that our summary of Lost in a Good Book makes no sense. Yet, anyone fortunate enough to have read The Eyre Affair will understand that sense is a rare commodity in Thursday Next’s bizarro world. The second book in the series is no different, which is why Jaspier Fforde rocks! 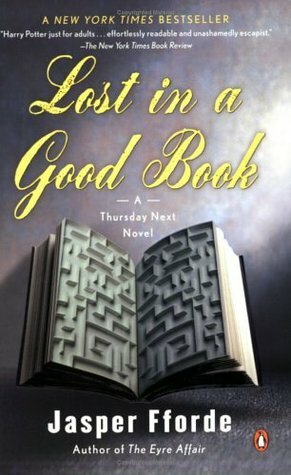 Lost in a Good Book was a delightful read with plenty of ingenious wordplay and more than a couple well placed puns. There was an entire cast of fantastic characters, like Lord Volescamper, Akrid Snell, Aornis Hades, and Miss Havisham. Who knew Miss Havisham was such an adrenaline junkie? The novel also introduces the reader to Jurisfiction, which is a watchdog organization that patrols the world of literature. It’s was a blast to find out all the problems that can occur within the BookWorld – rogue characters, grammasites, and stolen plot lines.¹ In summary, Lost in a Good Book is a treasure for any lover of science fiction and classic literature. Admittedly, this may seem like a weird combination, but it works for us. Oh, does it ever work for us. After tirelessly scanning the various Friday memes this morning, we’ve decided to partake in The Book Blogger Hop over at Crazy-for-Books!!! Question: How many books are currently in your To-Be-Read (TBR) pile? Obviously, the above choices could change without notice or explanation... Can't wait to find out how everyone else is managing their piles!!! William Goldman’s version of The Princess Bride is actually an abridgment of S. Morgenstern’s Classic Tale of True Love and High Adventure. What makes this so remarkable is that S. Morgenstern is actually a mere invention of William Goldman’s mind. Get it? The novel contains two separate narratives. The first is the exciting story of Buttercup, Westley, iocaine powder, ROUSes, and a gentleman with six fingers. The second is an entirely fictitious account of William Goldman’s life and the tedious process of abridging a lengthy novel focused on the excess of European high society. Our initial opinion of the actual abridgment is positive. The story was funny, thrilling, suspenseful and romantic. The dialogue was witty although every line felt like it would translate perfectly into a screen play... The characters were great and in the case of Fezzik – larger than life. The added realness of Westley and Buttercup’s relationship was welcomed, although the reunion scene at the base of the Fire Swamp left much to be desired... We also learned some valuable insight into how tensions between Gilder and Florin escalated over a hat collection and the important distinctions between Snow Sand and Lightning Sand. And then there’s the separate narrative about how the abridgement came about. Our opinion is not so positive. Yes, the technique was quite unique and at times funny, but it was also distracting. Each time the abridgment was interrupted for some additional insight, we kind of just wanted to get back to the story. Answer: One word of caution: “Awww” moments tend to appear at the very end of novels – we apologize in advance for any PPR (Premature Plot Reveal). 2. Sam’s marriage to Rosie (The Return of the King) – Even though this scene is tucked at the very end of the trilogy, it’s great to finally hear some good news for the greatest BFF of all time. 3. Fleur’s declaration of love in the hospital (Harry Potter and the Half Blood Prince) – There’re plenty of “Awww” scenes throughout this series, but for us Fleur’s verbal commitment to Bill despite his grisly face-job was quite touching. 5. Final garden scene between Colin and father (The Secret Garden) – When hardness and bitterness give way to forgiveness and acceptance... the definition of an “Awww” moment. 7. The Butterfly scene (The Very Hungry Caterpillar) – This insect had quite the appetite and paid the price, yet in the end he received his reward. 8. Father’s return (Little Women) – What could be more precious than a father’s long anticipated return to his little women. 9. The come to their senses scene between Elizabeth and Darcy (Pride and Prejudice) – With so much arrogance and presumption it was only a matter of time before an epic “Awww” moment. 10. Roses on graduation day (A Tree Grows in Brooklyn) – Flowers from dad... we won’t say anything more. Quite touching. Why: The Color Purple represents our first voyage into the critically acclaimed Books to Movies Challenge! Honestly (doesn’t that make you wonder when we haven’t been as forthright? ), we couldn’t have started with a more complete and emotionally charged book / movie. Not sure why it took us so long to attempt this fantastic work. Celie’s life is filled with just about every hardship imaginable - raped by her father, brutalized by her husband, and maliciously denied her sister. Yet, somehow she perseveres. She finds friendship in a woman named Shug Avery, who happens to be the object of desire for Celie’s husband. And as the relationship between the unlikely pair flourishes, Celie fights to establish her voice and free herself from her oppressive husband. 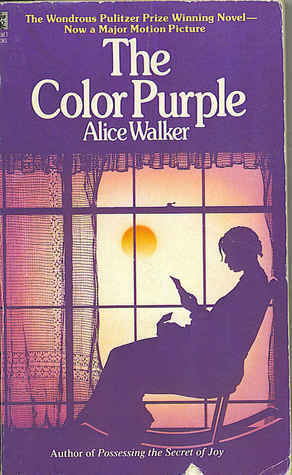 The Book: The Color Purple is so much more complex that we could hope to condense into the above summary. The glimpse into this era was as appalling as it was profound. The narrator, Celie, has a unique and powerful voice that touches the reader. Actually, all the characters felt larger than life, despite their oppressive circumstances. The correspondence between the sisters was probably the most touching aspect of the novel, although it was amazing to watch Celie develop and mature. Mister, in all his loathsome glory, was also a fascinating character who... actually we shouldn’t say any more. He was just interesting – in a despicable sort of way. In our opinion, the novel won the day, but the margin was narrow. The letter format in the novel added to our experience and the details of Nettie’s life added a dimension that was missed in the movie. Still, you can’t go wrong with either – just be sure you read the book first. We do have ways of finding these things out! It’s been far too many weeks since our last Friday meme. 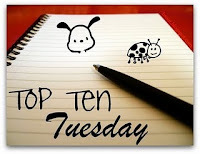 After coming across this week’s Literary Blog Hop question at The Blue Bookcase, we decided to end our dry spell. Question: What other outside influences affect your reading experience? Do you think these influences enhance or detract from the experience? Answer: To be honest, there are too many outside influences to list in one blog post. A quick 30 second brainstorming exercise identified the following: Life experiences, current events, prior author experience, previously viewed movie adaptations, life stage, current emotional state. And as much as we try to safeguard our bookish endeavors, we fail miserably. Below is a sampling of the influences affecting our reading experience. Audio Books – Our long daily commute necessitates the frequent use of audio books. Narrator quality has a HUGE impact on the overall book experience. Many of our favorite books have only been experienced through a fantastic audio book adaptation (I Capture the Castle, Jane Eyre, and The Time Traveler’s Wife). We wonder if our opinion would have been enhanced or detracted by a traditional read. Blogosphere hype – As a general rule, this influence only has the power to detract. While hype has inspired us to move a novel up our TBR list, rarely have we encountered a super-hyped book exceeding the hype. A few of these books have met the hype, but we were already expecting that. More times than not, we find disappointment at the end of a super-hyped book. Not because the book was bad, but it just wasn’t as good as what 10,000 other bloggers led us to believe. Obviously, we’re not talking about any of the books you recommended. Previous reads – In many cases, a previous book can have a profound influence on the current book. Whatever book we read after The Hobbit or Gone with the Wind or The Eyre Affair surely suffered by comparison. We also try to genre hop as much as possible, because too much of the same thing can be a drag. As much as we loved The Hitchhiker’s Guide to the Galaxy we don’t recommend reading through the trilogy in five parts back to back to back to back to back. Aggressive TBR list – We’re a bit challenge challenged and we’re secure enough to admit it. The cute little “100+ books in a year” bird likes to sit on our shoulder and motivate us towards our goal. Sometimes this bird can even be a tad bit pushy and encourage us to speed through a novel. Actually, maybe time is more to blame (that bird is pretty cute). If only we had more time then we’d be able to read at a more leisurely pace and reflect more on the plot and characters. Whew... that’s all we got for today. Let us know what factor influence your bookish endeavors. Answer: We've been looking forward to this week’s question for quite some time, although, to force us to stick with only 10 seems almost cruel. Nonetheless, below are our most desirable settings from literature. 1. Shire and Rivendell (The Hobbit) – There are several places in Middle Earth that we’d sign up to explore but these 2 stand at the top of our list. 2. Willy Wonka’s Factory (Charlie and the Chocolate Factory) – Further commentary defending this choice seems entirely unnecessary. 4. Pemberley (Pride and Prejudice) – We’re suckers for the English countryside... Sadly, we’re unable to speak from firsthand experience. Hanging out at the Darcy family estate would be an ideal place to cut our teeth. 5. Narnia (The Chronicles of Narnia) – No specific place, just all of Narnia. We wouldn’t need a guide or anything like that, just about a month or two. And ideally we’d get there through the wardrobe. 6. Terabithia (The Bridge to Terabithia) – We’d love to explore the woods that Jesse and Leslie claimed as their secret kingdom. 7. Cemetery of Unforgotten Books (The Shadow of the Wind) – This is kind of a no brainer – and of course we’d want to select a book. Actually, all of Barcelona is described with such beauty that we’d love to hang out in the city for a few days. 8. Cliffs of Insanity (The Princess Bride) – How neat would it be to set out a picnic blanket 2 – 3 feet from the edge and just gaze out over the cove and Florin countryside. 9. The Secret Garden (The Secret Garden) – What a treat it would be to wander around these grounds after Mary, Dickon, and Collin made their improvements. Despite this recent setback we are still quite excited to have achieved this milestone (we hope the abundance of exclamation marks will help set the tone)!!! Our 8 months of committed book blogging have been a blast and we look forward to many, many more reviews. Thank you to everyone who has actually read (and commented) on our posts! The novel opens with a skills test, as Mr. Norrell proves himself as the last practicing magician of the age (which happens to be early 19th century England). He quickly becomes the lone authority on magic, and lends his talents to several causes, including the failing war against Napoleon. Amidst Norrell’s growing popularity, a sinister force with thistle down hair is release into the world. At the same, a second magician is thrust to the forefront and together Strange and Norrell become a magic dynamic duo on par with Dumbledore and Grindelwald. Alas, the partnership is not meant to be, which only adds intrigue to the eventual no holds bar magical showdown against the previously mentioned sinister force with thistle down hair. Jonathan Strange & Mr. Norrell is a treasure-trove of complexity and background information. While this adds infinite richness and depth, the narrative also had a tendency to get bogged down at times. It also took a while for us to really get into the story. That being said, we loved how the magical lore was woven seamlessly through England’s history and the Napoleonic Wars. The writing was superb, the style flawless, and the whit had us laughing throughout. 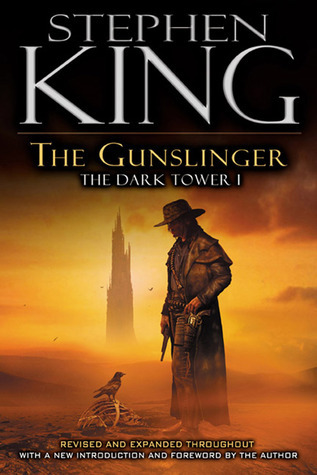 The novel also contained one of the most ingenious book selling techniques of all time – a book of magic that disappears after purchase, forcing the reader to buy a second copy. Jonathan Strange & Mr. Norrell is more about the journey and less about the destination. Hang on at the beginning and your bookish desires will be rewarded. READY... SET... wait for it........ GO!!!! Oh, and it's never too late to join in the fun. Click here to sign up! Special thanks to everyone who has joined the challenge!! !